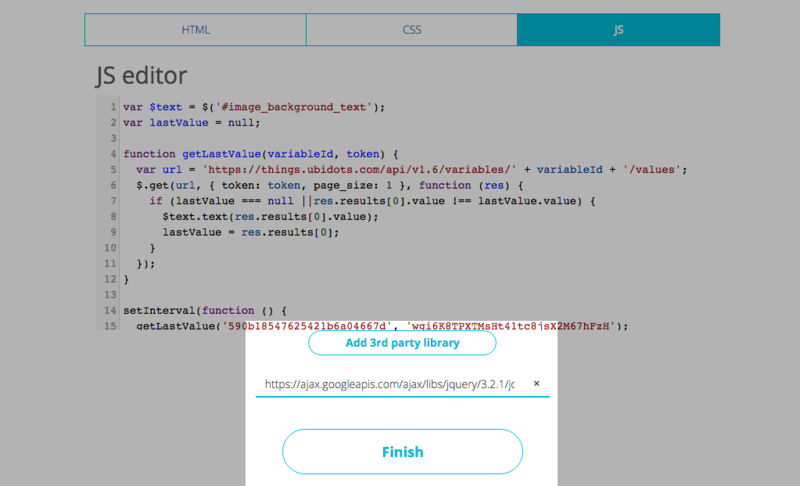 How to design a custom HTML Widget using Ubidots. Ubidots offers many off-the-shelf widgets that cover visualization and control needs for your IoT projects. However, in some projects you may want to code your own customized widget. Knowing some of our users have customization needs beyond our white-glove customer service we wanted to better educate users to the capabilities of their data. Using your own HTML/JS/CSS code you can create your own custom widgets. In this introductory HTML Canvas demo, we will demonstrate a simple development to monitor a non-static variable. For example, temperature on a 0-100 degree scale. To better understand this - check out the final product here. We have made the sliding scale manual for you to understand this application, but the scale can be powered by a sensor's variables or manual control based on your coding and desired application. Now, let's see how we created this custom widget? 1- Start by logging into your Ubidots application. Login to your Industrial account by clicking here. Click on "HTML Canvas" then "Blank"
4- After selecting blank, the Editor will appear. 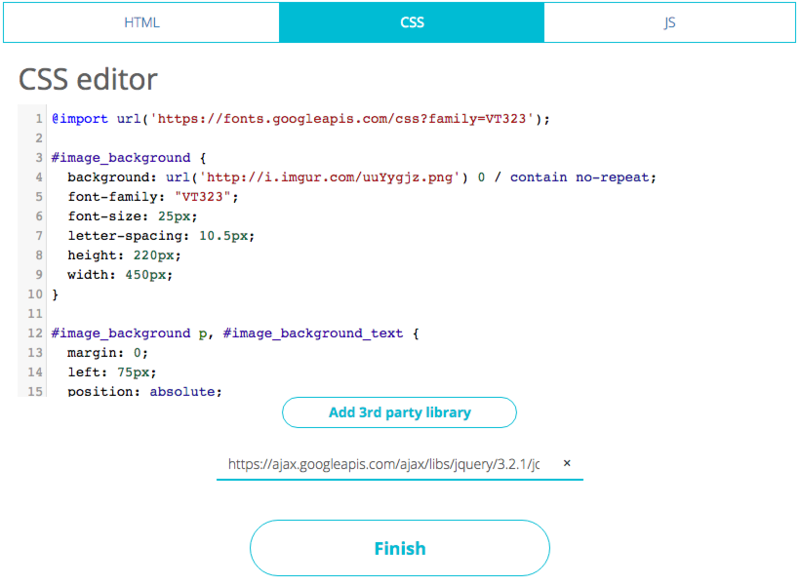 This coding box contains 3 tabs: HTML, CSS and JS. The first tab we will insert HTML Code. This code will create the markup for our widget. 5- The second tab is CSS. This code will give style to our HTML markup; HTML by itself is pretty ugly (or maybe we are the only ones who think so). 7- The section below the canvas window is for importing 3rd party libraries, as you can see, we have an URL added there. 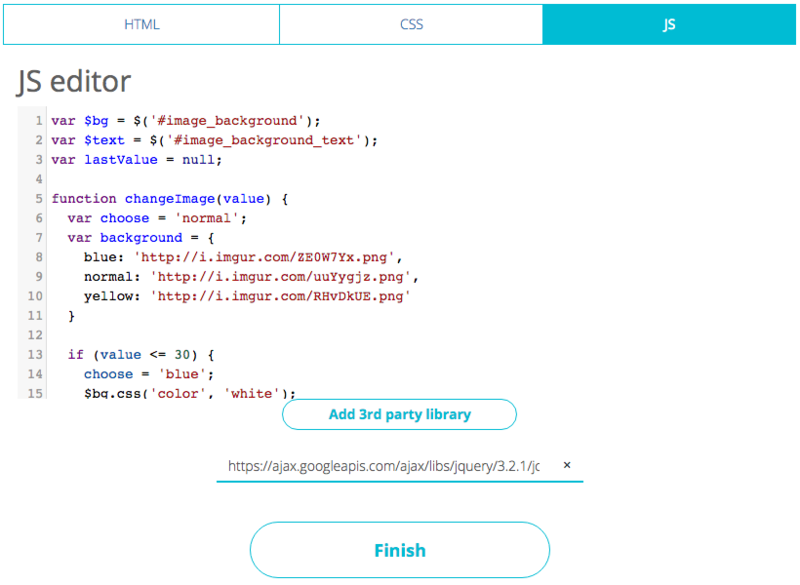 This is the Google CDN for jQuery. A CDN is a service given by a third party which hosts this library and lets us use it our applications. 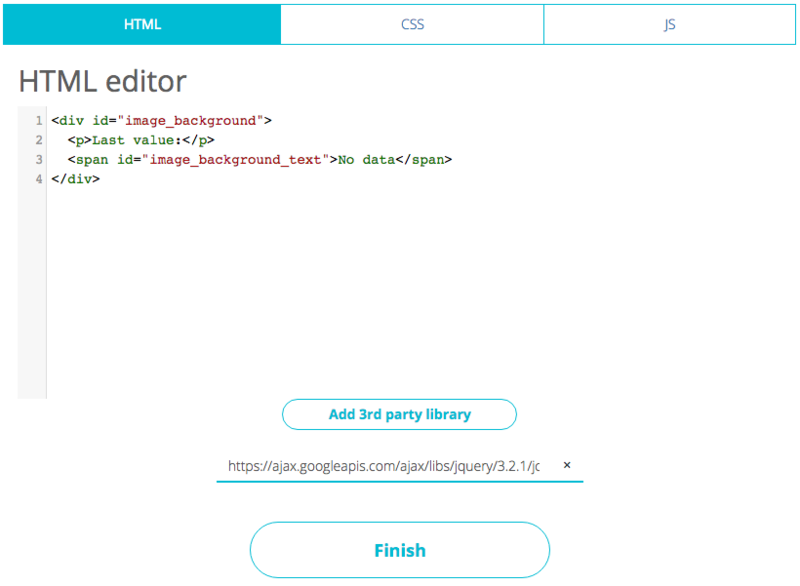 jQuery is a library that will let us manipulate the DOM simply. The DOM is literally everything you see in your browser. 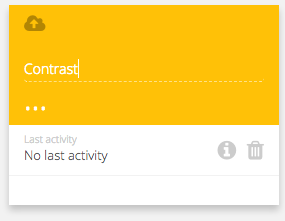 With this final step you have completed your custom color adjusting widget based pre-determined triggers of 30 and 70. The final Dashboard Display here. Wait - You Want One More Layer? To further display the capabilities of this HTML Canvas, let's keep going. Our widget demo was designed to adjust a display based on triggers (30 & 70). But, what if you wanted to go one more layer and overlay an image onto another image? This is possible too with Ubidots HTML Canvas. Using an LCD display image, we coded HTML to adjust contrast according to a variables value. LCD screens user an analog input. This lets you change the contrast of the screen by varying the current, we will do something similar here with a new variable. 1- Create a new variable. I'm going to create this new variable called contrast called Ubidots. 2- Use the new assets of the screen. As we are just modifying the display of the LCD screen, we need to separate the display screen from the boarder. We will work with two images: The LCD screen body and the LCD display. Thank you for learning a little bit more about Ubidots and our HTML Canvas widget. Now it is your turn to build a custom widget tailored to your specific application needs. If you develop something amazing, please share it with us on Facebook, Twitter, or Youtube.